Nancy Atkinson’s new book Incredible Stories from Space is just out. Lots of astronomical books are rolling out this year just in time for holiday shopping. One of the most pleasant is Nancy Atkinson’s Incredible Stories from Space: A Behind-the-Scenes Look at the Missions Changing Our View of the Cosmos (224 pp., paper, Page Street Press, Salem, Massachusetts, 2016, $20; ISBN 978–1–62414–317–5). 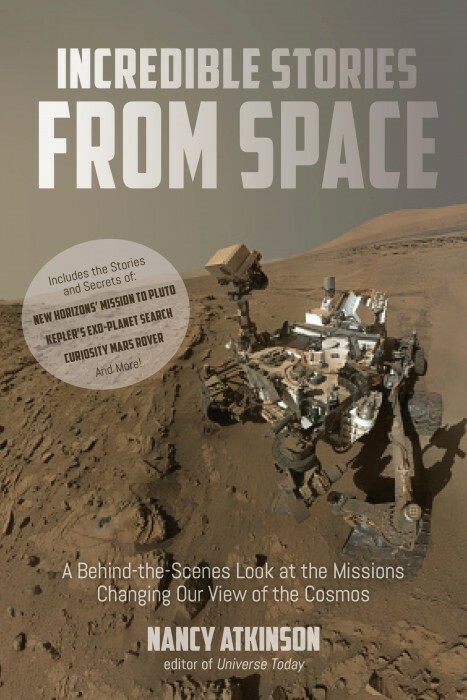 This highly entertaining book presents a sweeping narrative journey through many recent space missions, from New Horizons and Pluto, to the Curiosity rover on Mars, to a review of the Hubble Space Telescope, to many other planetary science missions. This is not a book about the human exploration of space; rather, it is chock full of good science results, liberally sprinkled with well-reproduced color photos, and brimming with good science writing style — entertaining stories, explanations, and anecdotes. Other missions that receive significant coverage include Dawn to Ceres and Vesta, Kepler and its revolutionary success with exoplanet discovery, a review of the Cassini-Huygens mission to Saturn, SDO and its fantastic solar research and imaging, the Mars Reconnaissance Orbiter, and the Lunar Reconnaissance Orbiter. There’s also a chapter on upcoming space missions. Atkinson, Editor of the Universe Today website (universetoday.com), is to be commended for assembling a highly entertaining and informative read. Such a book could have walked through pretty predictable territory, not adding significantly to what has been said in many other places. Atkinson’s approach is genuine, informed, and enthusiastic, however, and her expertise shines on each page. This is one book you’ll be very happy to have opened up during the holiday season.